Dubbed the '308' this cam was developed by Russell Engineering as the ultimate current full race cam for long circuit racers where peak power is required at extended rpm levels and for light weight race cars. Works extremely well particularly in the larger capacity race engines from 1330 upwards. Astonishing torque and pick-up for a race cam with near-limitless rpm potential. Primarily developed for use with Weber carburettion. Where standard diameter followers are to be used, to avoid premature wear I very strongly advise, on the point of insistence, that you use the cam followers sold on this site ( CST3025 race type) as they have had the face re-profiled to give them the essential correct shape absent from the vast majority of followers on the market. Never use used cam followers unless it is on the cam they came from and where position numbered. For best results, it requires the block follower bores to be bored/reamed out to take larger diameter cam followers (CST3023). 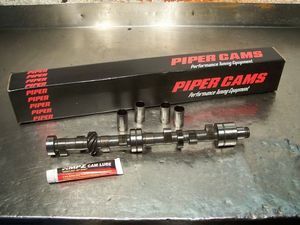 Kit contains cross-drilled camshaft on a blank, large diameter cam followers, cam lube, valve springs and installation instructions.